Very nice! Have a healthy and happy 2014 with lots of music! Hello Satyr..well the Smetana Qt/Supraphon: Smetana 1/2 are very nice too - but are on CD. Have a Happy New Year too - and see who's first to adopt 'a healthier lifestyle' than maintaining Blogs!! Happy New Year !!! JOYEUSE ANNEE 2014 !!! Thank you for yet another great transfer! How unfortunate about the recordings you have that are on CD, they will never sound this good..
Actually i got a USB-device for Christmas so i can now listen to HD-audio without using headphone-out of my laptop (first listened to Carmen Jones through it! ), so at the moment don't know how i can go back to listening CD's anymore. Happy New Year to Yourself (and Missus..) and to Centuri (a.o, mostly unknown..). I could never use the Dell laptop's for checking the file/s via the HiFi's due to there being no S/PDIF out - and the 'High Definition' headphone socket wasn't exactly that (except for the Sony Laptop speakers: which enables me to hear a few traces of surface-noise on this via Foobar - but 'never' via Audacity, when editing..though it was another 4/5 years before Decca managed 'near-perfect' surfaces (at least for a few years..LOL). I should've done 24/96 from a few years back - but the Terratec DMX6 fire 24/96 only works on 98SE and XP - and the XP machine's HD went 'phut' - so that became Ubuntu Linux..and had trouble activating it on the ancient Dell;98SE - so left it until recently; works perfectly now...a bit late in the day,TBH.. I DO like the D. 887 particularly. Nice attention to dynamic shaping and a nice "lift" to the last mvt. It's a shame the sound is rather compressed, but it's certainly not awful sound by any stretch. I see some evidence that these were issued in the stereo SVBX series, but I don't know if they are true stereo, and those sets seem even harder to come by. 1957/58 who knows. I was surprised when a friend turned up the Joseph Schuster/Wuhrer Beethoven Cello box in a true stereo copy. Thank you. You are the greatest. And good luck in dealing with the continuing and never ending bane of bozos. The 'biggy problem' was it took a few days to discover it was M.Bozo - and I had to protect the files in the interim. I'll leave Neal to do the Schubert's (I'm not too keen on their 'Trout') - but it's a pity the excellent Mozart: Oboe Qt/Horn Qnt (1966 Decca UK Turnabout) is probably 'in copyright', as can only trace a previous DL/STDL: released UK, early 1965; though the US VOX may be earlier '60s ?? As if on cue, I put my hands on a SVBX copy of V. 2 of the Endres Schubert, and right on the front cover it states "Electronically reprocessed to simulate stereo". And for $3 I found out how horrible it sounds! Someone listed one of these boxes for $60, more than the original VBX ones are going for. Not a good investment! In any case, I'm glad to put the possibility of real stereo on these to rest. 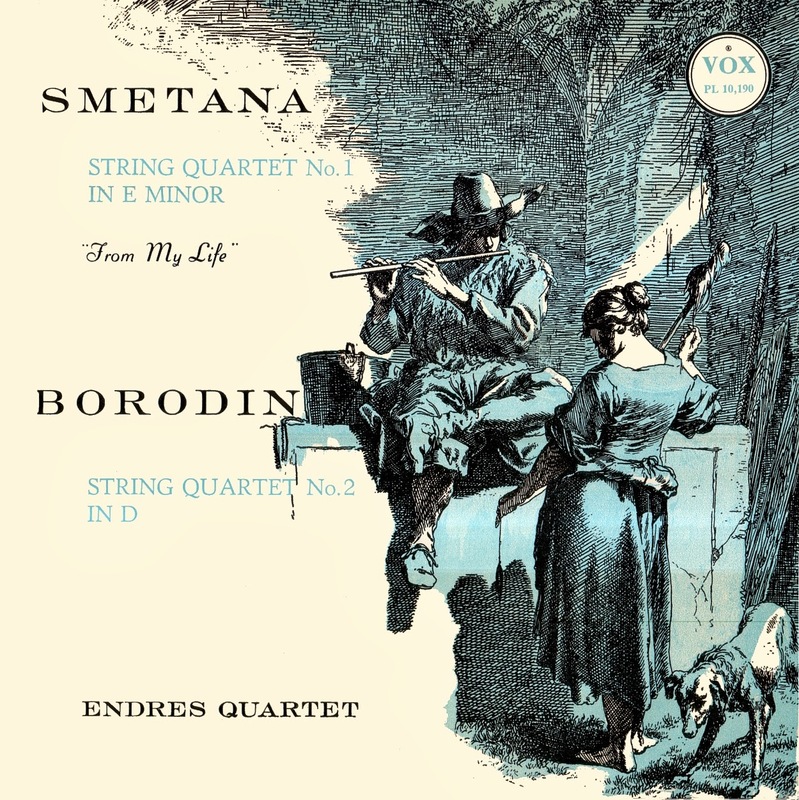 Hello ther, I am an 80+ record collector and music lover who found the Vox PL 10190 LP of Endres Quartet's Smetana and Borodin works. Just replayed the Smetana with the following set-up. Pionee3r amp - nothing special but has done great service; Goldring Lenco turntable with an old mono cartridge in the headshell - no proper fittings, bedded on a piece of Blutak, the LP stylus selected of course, a double which plays my 78s as well, all this into left hand cabinet of huge annd very heavy vintage Goodson speaker assemblies. Music plays from left hand speaker only, but I turned the balance to full left anyway. Tone setting - bass middle setting, treble minus three spots, volume under 1 on the dial, the cartridge has powerful output. Listened in high backed padded chair about 8 fett distant. I have fitted a one inch thick mahoganny reflector behind the head position to reflect overtones. Result. Absolute perfection. The charity shop find cost 25 pence and bears many surface marks , all inaudible on playback. 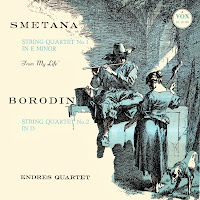 A truly delightful second movement with its Viennese style joke, and beautiful cello tone. 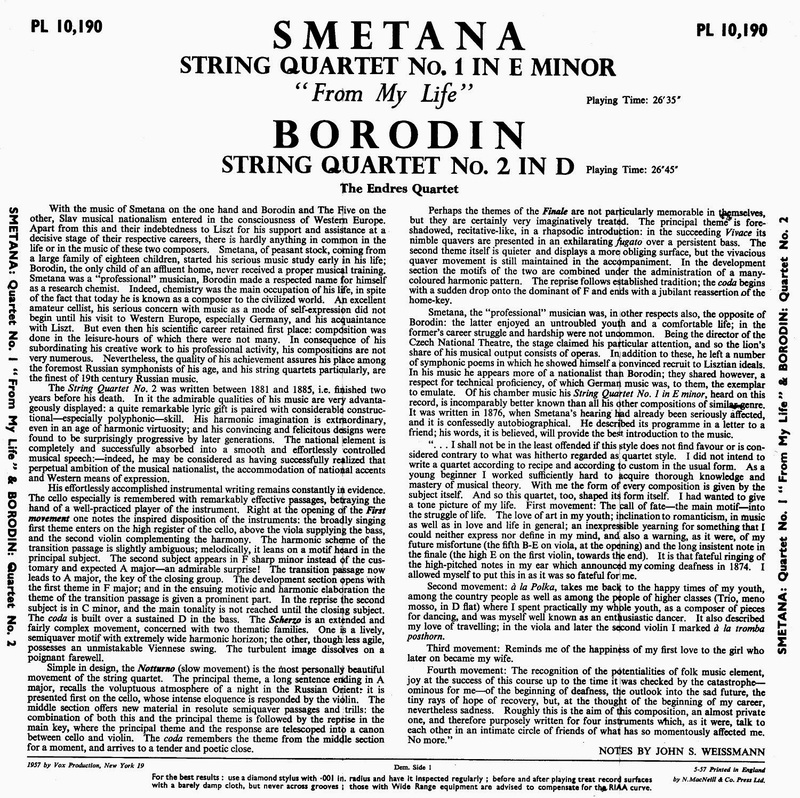 Moral - record reviews are dependant on too many variables to be taken seriously, unless the performers are sub standard, on this record my only criticism might have been that Smetana did not give enough prominence the the lead violin, otherwise a great 55 year old record and proving that mono can still be very satisfying misically. 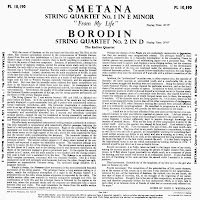 PS The Borodin is a favourite too, although it's hard to blank out the pop plagiarism on that wonderful melody. CM Sussex.